Apparently the white pelicans, both male and female, get this lovely HUMP on their beak during mating season. Not sure just exactly WHO thought that was particularly attractive, but I guess it’s working for them since they keep reproducing, so there you go. YOU DO YOU, big guy! Caught this guy (or gal - who knows) at the local zoo earlier this year and had a great time catching his bathing antics. Camera Club has started back up this month, and for several reasons, I’ve been debating whether or not to join again this year. I have SO MANY photo shoot days that have been simply downloaded to the computer but not looked at beyond that point. And as the deadline loomed nearer and nearer for our first competition, I was furiously scrambling through months and months of photos trying to find 2 that were worthy of submission. The choice for the Nature category hung between a couple pelican shots, none of which felt right. So at the last minute, I started looking through more and more shoots, and finally came across this series, and this one was the hands-down winner. Quite the action, almost feel like I shouldn't be watching. Most interesting about the hump. Beautiful capture. I love the splashes. @onewing What are yours like??? 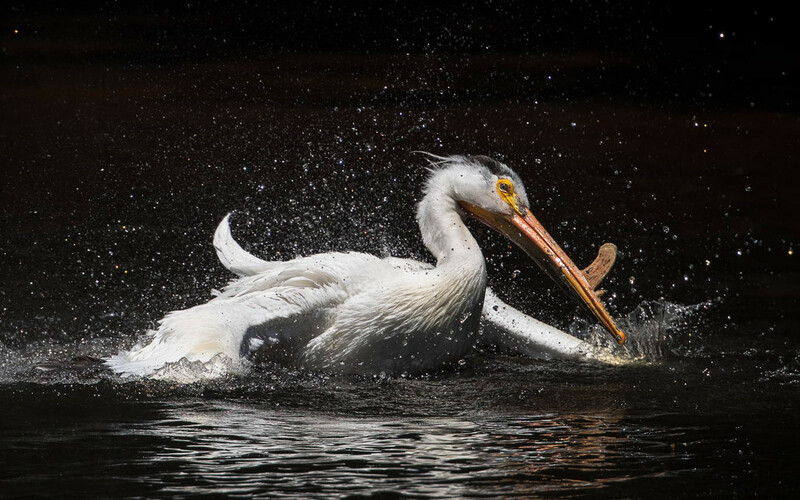 @onewing You do have some great pelican shots! VERY ENVIOUS!!!! I love those guys! Great timing and love it viewed on black!